Are you thinking about having a New Year’s Party this year? If so, now is the time to get it planned. Figure who you want to invite and get those invitations sent. New Year’s Eve parties have come along way from just the champagne celebrations of the past. You can go for such fun ideas as formal parties. Who doesn’t like to dress up once in a while? Or a casual, crazy party. Maybe even a game night for the whole family to share in. Picking your ideas or themes can be easy when you go through the custom invitations that are available. That’s always my first choice when I’m trying to think of what theme I want to use for my next party. Here are some options ready to go for you. 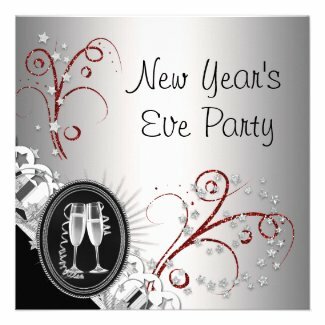 Elegant New Year’s Eve Party Invitations gives you plenty of classy looking options. Maybe Fun or Cute New Year’s Eve parties is more your bag. Perhaps you are into vintage or retro style. Then take a look at Vintage New Year’s Eve Party Invitations. You can even find a Roaring 20’s look. Even if you are going for a non-traditional style party, you want to celebrate midnight. So make sure you have plenty of New Year’s Eve hats, noisemakers and favors on hand for everyone to ring in the new year. More noisemakers, hats and lots of other party supplies are available through eBay auction. You might find the deal you are looking for through eBay. Celebrating New Year’s Eve can be a fun event for all involved. Just have a little fun this year and enjoy yourself. I love New Year’s Eve parties and have hosted quite a few in my day. The invitation is very important and you have some great suggestions! I really do love New Year’s Eve parties and staying awake the greet the new year. These are beautiful New Year’s Eve Party invitations! Makes me want to plan my own party this year.